Laura has organized a crafting challenge for all of you baseball lovers. She came in to the studio all excited about this challenge so she has written this up for you. Join her in the fun with the opening game this Monday. Recently, the blogger earthchicknits.com posted [Crackerjack: A Conceptual Knitting Project](http://earthchicknits.com/2014/03/20/crackerjack-a-conceptual-knitting-project-any-baseball-fans-want-to-join-me/) in which she delineates her plan for knitting a scarf that represents her hometown team's 162-game season in a striped scarf. By designating specific colors for home and away wins and losses, the scarf will reflect the team's record and keep her warm for post-season play. 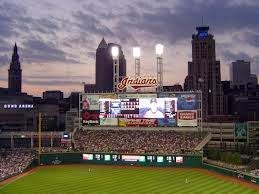 I'm in for the Indians season, beginning against Oakland (away) on Monday, March 31. If you want to join the fun, I pulled the Indians team colors in Berroco Comfort a worsted-weight option. Many other choices exist so shop on line for your home team or stop by the Sloane Avenue studio to Pick your colors. Options in every weight from lace to super-bulky. Maybe striped socks to represent the season--81 games per leg? I learned alot about the Embrace yarn by Reywa Fibers when making my Rikki Hat. I have to say most if it was operator error. My mistakes will help prevent yours! I have to tell you first of all that I loved working with this yarn, but I did not apply my knitting common sense rules prior to starting. The Rikki Hat is a slouchy hat so I kept on trying to convince myself that everything was going to be alright when it was done. I have included the picture with an iphone on it so you can get a sense of the size of it. I used needles smaller than those called for, totally convinced that all would work out. Guess what I did not do! I did not do a washed gauge. Yes my friends, I preach the gauge message to you all the time but did not follow my own advice. And here you go, a slouchy hat that was a little loose when I finished. 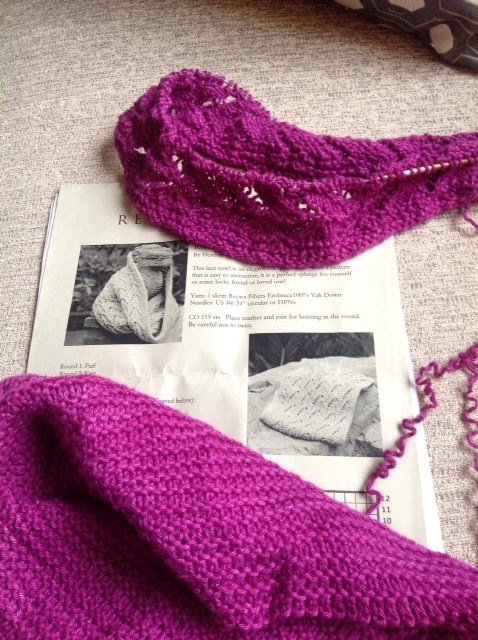 It looked good and loosely fit when I took it off the needles; though I wanted to wash it to even out my knitting. I wanted to wash it in a washing machine but first researched whether yak felts. It does. I decided to hand wash it but as I was washing I decided that it seemed to be growing more than anything else. Based on the felting concept I decided to start agitating hoping that it would felt up a bit. Guess what, it did not and just kept on growing. I used a very bright fuchsia/pink color because I wanted color! Well, while I was washing it the water became very bright in color. The hat retained its color but the water changed. So more words of advice to you. Do not stripe this yarn unless you test it first. 1.Gauge and wash the gauge..you want to know how it is going to grow. 2. 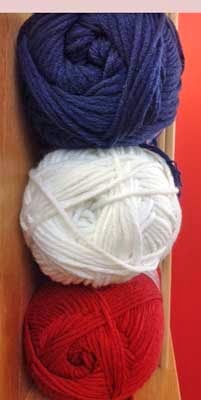 Prior to mixing colors, wash the yarn to check for bleeding. I'm not sure what the other colors will do but my bright color definitely bled. The end of the story. I am going to rip open my hat and try again(not Rikki). 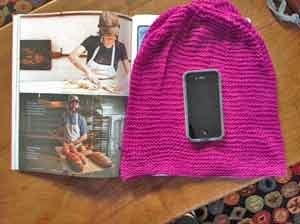 I reviewed the ravelry projects and no one was complaining about hats they had made out of embrace. So again i say, "operator error". By the way, If you get a chance congratulate the folks at Blackbird Baking Company on the wonderful article that appeared in Edible Cleveland this spring. You can see the picture right next to my hat.